Findings amended to include contributions of JAs to Arts District. Cultural Heritage Commissioners Gail Kennard (vice president), Richard Barron (president) and Barry Milofsky. 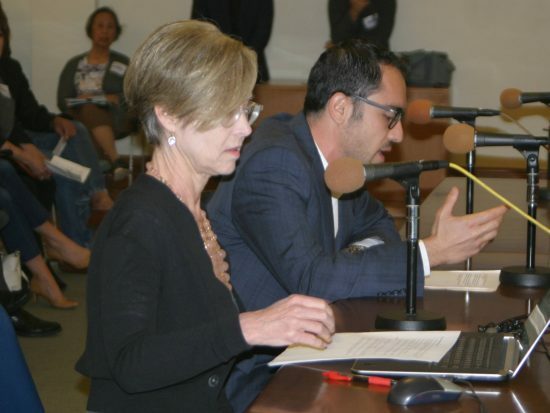 A packed hearing of the Los Angeles Cultural Heritage Commission on Dec. 7 at City Hall had mixed results for the resident artists of 800 Traction Ave. and their supporters. With the artists facing eviction, the 800 Traction Ave. Support Committee has opposed an application by the new owner, DLJ Real Estate Capital Partners, for cultural-historic monument status, arguing that it will give the owner millions in tax breaks once the tenants are gone. At issue at the meeting was a report done for DLJ by GPA Consulting, which, critics said, ignored contributions of Japanese American and other artists associated with the building to the development of the Arts District. The status of the site will next be taken up by the city’s Planning and Land Use Commission and then by the City Council. 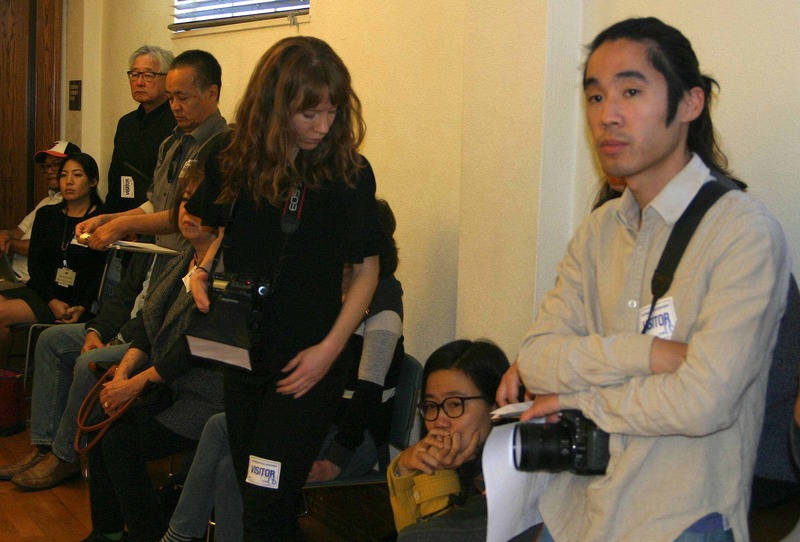 Speakers included Dorothy Wong (seated), Taiji Miyagawa and Nancy Uyemura, one of the 800 Traction artists. Teresa Grimes of GPA Consulting and Timan Khoubian of DLJ Real Estate Capital Partners. 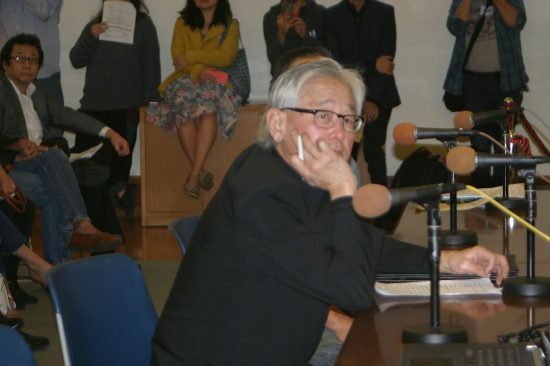 GPA acknowledged that renowned artist Matsumi “Mike” Kanemitsu (1930-1992) lived and worked in the building, and that he could be regarded as a “historic personage” under the guidelines for monument status. But based on his oral history, obituary articles and other sources, the report concluded that he only lived in the building for the last six years of his life, and his association with 800 Traction alone was not justification for historic designation. Noting that “many people here feel very passionately about the building,” Grimes stressed that GPA had to take an “academic” approach to its research and that the application would be amended if any new information came to light. The 800 Traction Ave. Support Committee came with a video about artists associated with Little Tokyo and the Arts District, and several witnesses. Miles Hamada, one of the 800 Traction artists. 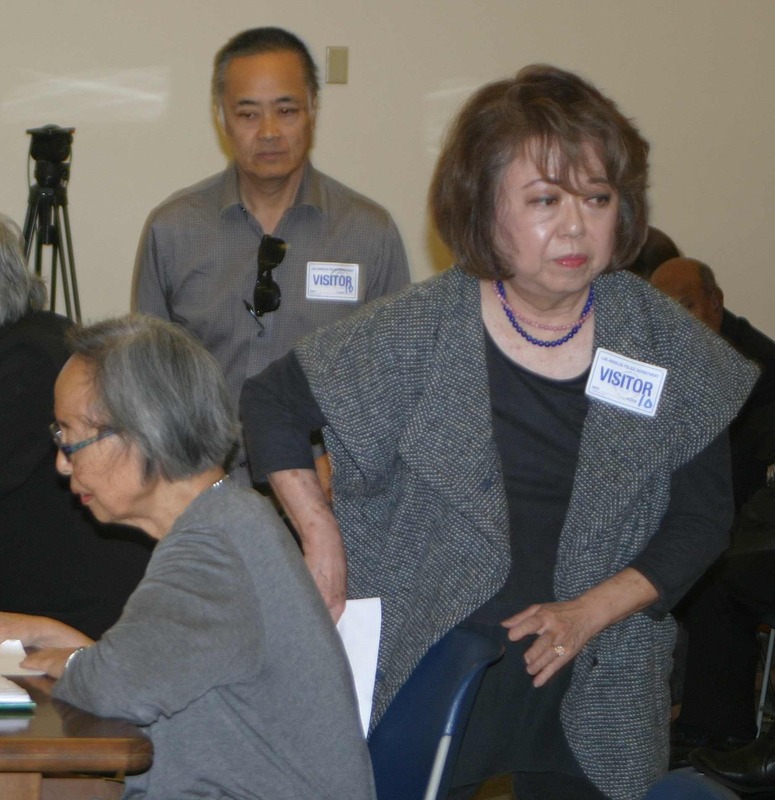 Taiji Miyagawa, head of the support committee, said that Japanese Americans are not new to having their culture suppressed, having been uprooted and incarcerated during World War II. “The city of Los Angeles has not been an innocent bystander to the displacement of our community. In 1952, about an entire block of Little Tokyo was taken away by the LAPD to build the Parker Center. During the ’70s and ’80s … the city colluded with Japanese and local corporations to eliminate over 80 percent of low-income housing here. 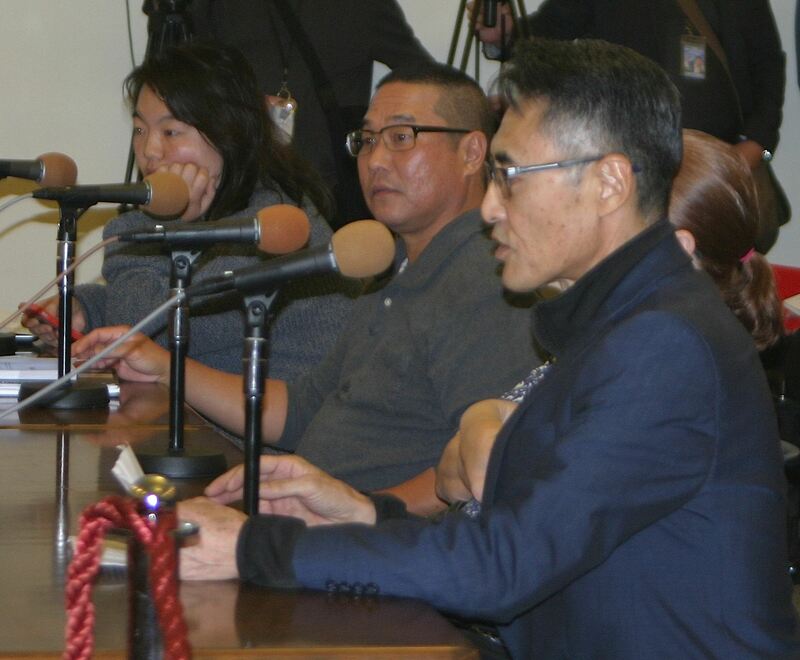 Advocates for the artists included Coco Kim, Alan Nakagawa and David Monkawa. Speakers supporting the artists included Scott Oshima (right) and Annie Shaw. Other speakers included artist Marc Oberhofer, a 26-year resident of 800 Traction; husband-and-wife filmmakers Stephen Seemeyer and Pamela Wilson, producers of a documentary called “Tales of the American,” which is about the Arts District’s American Hotel; Jonathan Gerald, secretary of Los Angeles Downtown Arts District Space; Peter Garnica, who described Hispanic artists’ contributions to 800 Traction; Annie Shaw of Chinatown Community for Equitable Development; Coco Kim of the Boyle Heights Alliance Against Artwashing and Displacement; and art student Andrea Aguilar, who was asked to leave after going over her allotted time but was cheered by the audience. Commission President Richard Barron told the audience, “This is the Cultural Heritage Commission. We don’t deal with affordable housing, as much as we might like to. We are here to look at preserving structures and other elements of the urban fabric that are important to the history of Los Angeles, and I personally feel that the Arts District is an important aspect of the city of Los Angeles’ cultural development. I’ve experienced it first-hand and I feel your pain when the Arts District is being threatened by development. “But I think whether we declare this a monument or not … the same result is going to happen. I think that having it declared actually may benefit the building [rather]than be a detriment to it. I’m more than willing, if my fellow commissioners agree, to create language within the application that speaks to the importance of this building in terms of a key component in the Arts District and those artists associated with the building. I think that would be an important addition to this application. I think that location is worthy, I think that building is worthy of being approved as being a monument. Barron also suggested that the arts advocates discuss the matter with Councilmember Jose Huizar, whose district includes the Arts District and Little Tokyo. 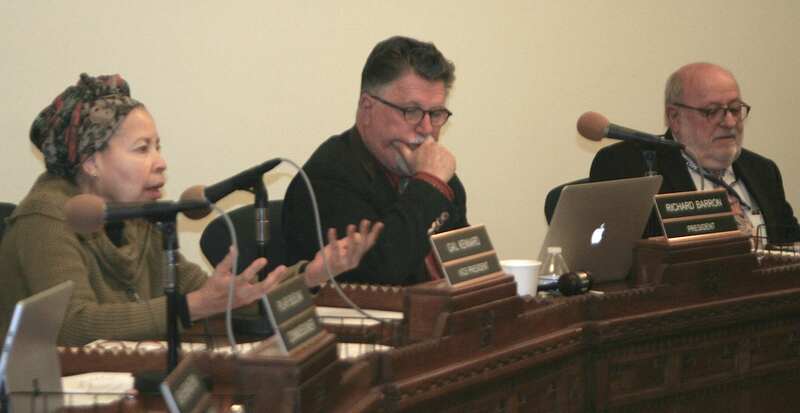 Commission Vice President Gail Kennard and Commissioners Pilar Buelna and Barry Milofsky expressed similar sentiments and agreed to the amended language.